When a band releases their sixth album in less than three years there are usually cause for concerns. When such a load of material is unleashed in such a short time it is generally valid to claim the bulk of said material ought to have never left the rehearsal room. 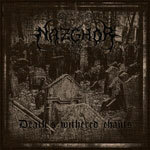 Admittedly, Nazghor had somehow evaded me until I stumbled upon their latest effort 'Death's Withered Chants'. Hence I cannot give testimony to the quality of their earlier material, but one thing is sure: 'Death's Withered Chants' heavily defies the golden rule of close releases. It is nothing short of brilliant! Hailing from Uppsala, Sweden I expected to be met by something very much akin to Watain. Sure there are several dark tremolo-driven elements in here that can be sourced back to Watain and in the end Bathory. But Nazghor does not only engulf the orthodox side of Swedish black metal but rather the entire history of the scene. There are equal amounts of melodic riffs and other elements from acts like Naglfar, Dissection and Necrophobic (incidently Anders Strokirk makes a guest appearance on 'Craft of the Nihilist') as there are aggressive, down-tuned Watain-styled guitar lines. The result is an impressive display of sorrow-filled, melancholic yet beautiful and outright moving black metal where melody meeting aggression. Admittedly, you will have heard most of this before if you are remotely acquainted with the Swedish scene but when the material holds such an outstanding quality lack of originality is of little importance. Nekhrid's vocals though holds a rather distinct tone that helps lend one unique element to the music and fits it perfectly. It is nearly impossible to pick certain favorites from the songs on 'Death's Withered Chants'. 'Under a Venomous Spell' is the most beautiful bitter-sweet song I have heard in years while 'Empire of Graves' is like staring into the abyss waiting to fall and all the other songs are closely behind. With such an impressive string of tunes presented on their sixth album in less than three years, Nazghor has shown that some acts truly have the ability to deliver often. Only the closing title track feels like it is bordering on being filler material. 'Death's Withered Chants' is definitely album-of-the-year material, an excellent homage to the Swedish inheritance and highly recommended for anyone enjoying black metal with both darkness and melody. The task to check out Nazghor's entire discography now lies before me and if the rest of their material comes even close to this we are looking at perhaps the most solid current act in Sweden.